• Rifts • Rift signatures • Rift removal • Iron Dimensional Door • Wooden Warp Door • Trans-Dimensional Trapdoor • User can create dimensions • Limbo The doors open up to reveal individual dimensions. If the doors are combined, many different structures can be built between the worlds, and linked together. If the doors are combined, many different structures can be built between the worlds, and linked together. In addition to the doors, several other features debut in this mod, including Limbo, Rifts, Rift Signatures, and Rift Removers. These aspects help the user manipulate reality, and dispatch the player to a variety of locations. More doors can be placed within the original pocket dimension, creating more dimensions, and this can go on into infinity. Every time a pocket is created, the player is led deeper into alternative planes and farther from the overworld. Rifts are unsteady, throbbing rips in the fabric of reality; it is a sign that reality is fading and an alternate plane is getting closer and stronger. A rift guides the user to a precise position, which can be a pocket dimension or a different location in the overworld. When a Dimensional Door is positioned, a rift appears at that location. If you place a wooden or iron Dimensional Door on a rift, you will be transported to the other end of the rift, and a door will be created there too. At times, the rift’s destination may lead to another rift that loops back, but not always. In either case, overlaying a rift with a Dimensional will open a path to the other side. All doors make a rift when first opened, but they are also contained within the rift, making it safe. However, if the door is eliminated, the rift will reappear. Rifts can also appear randomly. When rifts arise naturally, they frequently contain dungeons. When rifts are joined together, they can proliferate. The Rift Signature and the Rift Remover can be used to control rifts, but ifThere are two or more rifts close to one another, the group may spread and aliens sometimes know how to use them to enter from the other side. The Rift Remover is the only way to completely destroy Rifts. When Rift Remover is triggered close to a rift, it causes the rift to close, and the action spreads to other rifts that are nearby, closing all Rifts in the chain of interaction. The Rift Remover can be activated three times. After the third use, it completely disintegrates. The Rift Signature allows the player to make a pair of links that will instantly connect two locations. The Wooden Warp Door, the Trans-Dimensional Trapdoor, and Iron Dimensional Door Trapdoor all lead to alternate dimensions. When the Iron Dimensional Door is placed, it makes pocket dimension. If a user enters the door, he or she is teleported to an alien world where the fabric of reality is frayed. A player can use the Trans-Dimensional Trapdoor as a means of escape, and be teleported back to the door that first opened the chain. The Unstable Door is unique. It does not link to a specific rift; it can randomly transport a player to any rift. 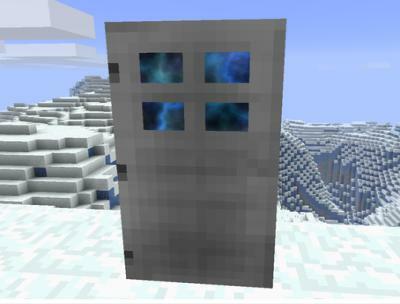 The Wooden Warp Door (WWD) creates a pocket dimension like the IDD, but this pocket dimension is closer to the overworld rather than farther away. Just as people sometimes get lost when traveling in the real world, when journeying into a new dimension, you may lose your footing and slide into Limbo. Limbo is a bleak, desolate space filled with fragments of broken reality. This is not a place for you to be. The only means of escape is to slip even further into the dregs until you bottom out at the black pit. If you touch down at this location, you will be immediately transported back to the overworld, but will find yourself at a random and possibly unfamiliar location. At times, the rules that dominate reality do not hold together. It’s possible for them to bend, twist, and rip when plied with certain instruments. If a player shoves reality aside and goes into the place between worlds with the Dimensional Doors Mod, other doors may pop open and lead to alternate realities. The Dimensional Doors Mod adds flavor to the game, makes way for individual creativity and exercises the mind. This mod is great entertainment for the young-and the young at heart.